Behind-the-Scenes Conversation: Is Kinder Morgan the Second Coming of Enron? While none of us expect an Enron-like collapse, three investors debate their expectations for Kinder Morgan going forward. Spoiler alert: They don't reach the same conclusion, but they might help you reach yours. Even when we're not writing about stocks, we're probably discussing some investment theme or stock that perks our interest. Here's a sneak peek at some of the conversations that go on behind the scenes with some of our writers here at The Motley Fool. 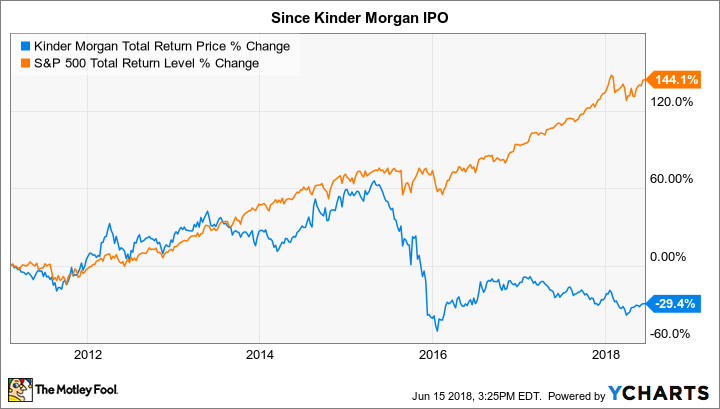 Recently, the topic of Kinder Morgan (NYSE:KMI) came up and whether the pipeline company truly is a great long-term investment or if it is just fleecing investors like its former parent company, Enron, did. Here's what a few of our contributors had to say about it. Matt DiLallo: While Kinder Morgan traces its roots back to Enron, there's a big difference between how Enron generated earnings and how Kinder Morgan makes money. Enron recorded huge profits by using aggressive tactics to trade energy. Kinder Morgan, on the other hand, makes most of its money shipping natural gas on its vast network of pipelines, collecting recurring fees supported by long-term contracts. Those fees add up. Kinder Morgan currently expects to generate roughly $7.5 billion in earnings this year. After paying taxes and the interest on its debt, the company should produce about $4.6 billion in free cash. The company plans to reinvest roughly half that money into expansion projects, which should help grow earnings and cash flow in the future. Kinder Morgan also intends to pay out about $1.8 billion of its cash in dividends to investors. That would leave it with around $500 million that it could use to repurchase shares, repay debt, or invest in additional expansion projects, though the company has already used about half that amount in buying back shares this year. Kinder Morgan's ability to produce cold, hard cash is why it's nothing like Enron, which generated paper profits. While there's no denying that Kinder Morgan has employed financial engineering in the past to help finance growth projects so it could expand faster, at its core, the company is a cash flow-generating machine. That cash flow positions it to create lasting value for investors over the long term, which is why Kinder Morgan is one of my top 10 holdings. Tyler Crowe: I can't argue the fact that Kinder Morgan's asset portfolio is a cash-generating machine. Pipelines and other energy infrastructure investments are some of the most stable sources of revenue in the energy business. For Kinder Morgan investors, though, those assets haven't translated into a wealth-building investment ever since its initial public offering back in 2011. 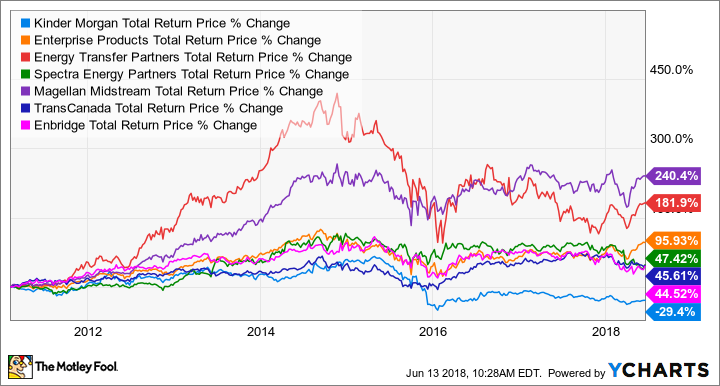 For all the bluster about Kinder Morgan's stable revenue streams and incredible growth prospects, its stock performance stands in stark contrast to its peers over that same time period. KMI Total Return Price data by YCharts. Every company here had to deal with the same issues Kinder Morgan faced over that time frame: maintaining a low cost of capital, invest in high-rate-of-return projects, and deal with the implications of the oil price plunge of 2014-2016. Yet no other company in this group suffered to the degree Kinder Morgan did. The one variable that stands out the most for Kinder Morgan is its management team. For years, it has wooed Wall Street and other investors with big numbers and promises that, frankly, it hasn't been able to keep. It wasn't that long ago that the company was bragging about a $17 billion backlog of projects with just as much in its "shadow backlog" that would fuel years and years of sustainable growth. Then, it said it needed to consolidate all of its subsidiary partnerships under the parent company to lower its cost of capital to pay for all of this growth. After that, management said it needed to cut its dividend to preserve its investment-grade credit rating and improve its debt metrics as well as high-grade its backlog, which is another term for admitting that many of its growth projects had low rates of return. Now, we have a company that just sold its largest growth asset and plans to use the cash to make acquisitions to fuel another wave of growth. If you ask several other midstream executives, though, this is not a good time to be buying because asset values are incredibly high and rates of return aren't great. At just about every turn, Kinder Morgan's management has tried to blow investors away with gaudy growth numbers, but those promises have forced it to make drastic financial moves that have come at the detriment of shareholders. It's entirely possible that the company has turned a corner and that management is going to be a more conservative capital allocator over time. However, it's already targeting 36% annual dividend growth between now and 2020, which just seems like more of the same promises it hasn't been able to keep in the past. The ironic thing is that I also agree -- to some extent -- with Matt. There will be substantial expansion of the pipeline, storage, and other oil and gas infrastructure assets Kinder Morgan owns and operates in the years to come, and it does have an experienced management team that should help it acquire and win its fair share of business to grow its already-solid earnings and cash flows. And I think it's also reasonable to expect Kinder Morgan to make investors money over the next five years or more. But I strongly believe investors can do better, investing in companies that have already shown they can consistently deliver market-beating returns. I could be wrong -- and I hope for Matt's sake I am -- but until Kinder Morgan shows it can be a superior investment over time, I'd invest elsewhere.